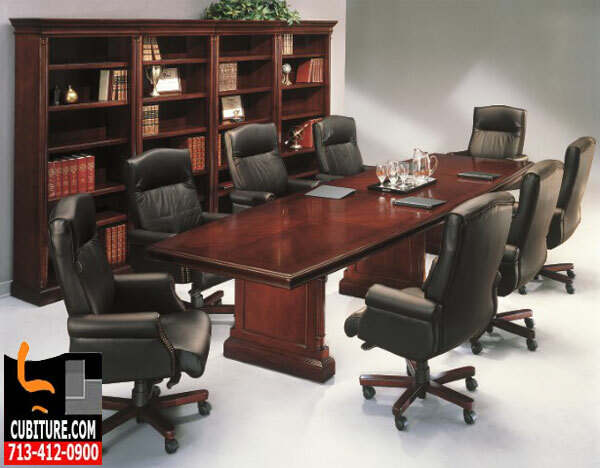 Office furniture establishes your office space and magnifies your corporate value. Knowing which types of furnishings to choose is essential to establishing a healthy, comfortable, and profitable work-space for your employees. With so many choices available to businesses, it is paramount to that you first have in mind a design layout that will guide your choices. Setting up your office for focused tasks, specialized applications, and efficient process flow will bring you a maximum return on your investment. Cubiture specializes in developing unique office furniture designs. We tend to avoid overusing the word “customization” because many people associate the word with inflated prices based upon luxury features. Innovative designs is a more appropriate description for what we do. Designs support individualized tasks and workflow requirements with a balance of comfort, efficiency, and style. Office furniture selections should be guided by the needs of the office spaces they help define. Work surfaces, seating options, storage, and collaborative spaces are defined from the ground up by the furnishings you choose to create them. These choices can be roughly categorized into unique groupings that comprehensively represent the full spectrum of our inventory from which you can make your selection. Desks, or desking systems as they are now called, represent the foundational surface area for workplace productivity. Desking systems include specialized components that support peripheral devices, telecommunications equipment, and personal workstations. Many lines offered by Cubiture also feature unique dimensions that are designed to accommodate specific floor plans, storage requirements, and space allocation needs. Seating is an essential component of desk systems. Employee comfort, maneuverability, and ergonomic support are critical factors influencing employee productivity. Chairs also add dimension to office furniture, magnifying its overall visual impact. Contemporary, traditional, and blends of contemporary and traditional can be found in our gallery an our showroom. File storage units come in a wide array of colors and styles that combine function with attractive form. 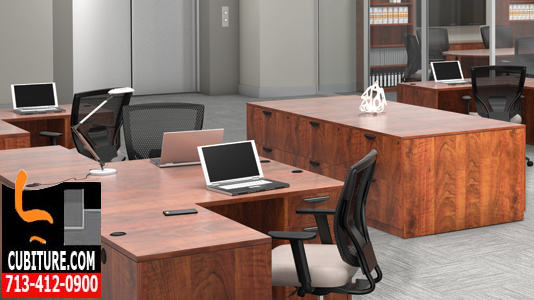 Leather, metal, and wood systems allow you to seamlessly blend storage areas into specific workspace areas. 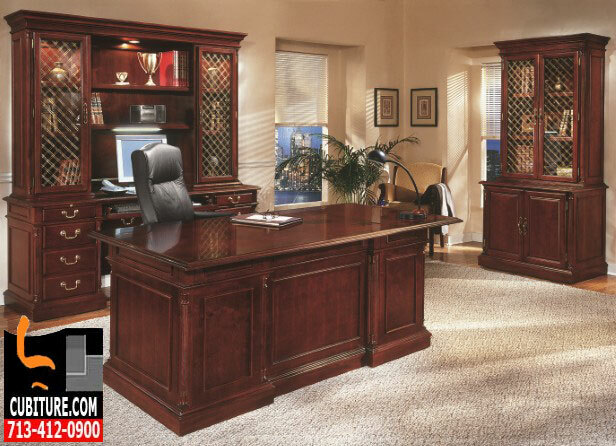 Millwork magnifies the impact of your most visible office furniture pieces. Casegoods can be enhanced with any number of decorative forms, styles, and dimensions. 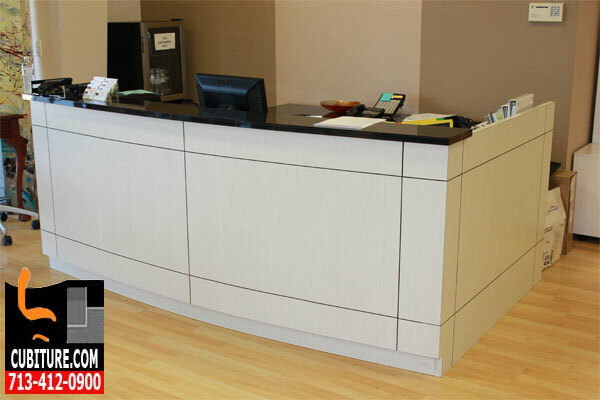 Millwork is also commonly done on reception desks, filing systems located near the reception area, and bookcases used for quick, convenient access to organized reference materials. Millwork directly expresses your corporate culture and sets the tone for your entire interior design. Conference rooms are created from a unique category of office furniture that includes tables, communications equipment, and seating. The typical conference room also has a projection screen for presentations, one or more whiteboards, and various IT/Communications hubs for laptops, tablets, and telephony products. Virtually every type of storage, desking, collaborative space, and seating arrangement can be replicated with an individually designed cubicle system. Such a system often represents a considerably lower cost than equivalent furnishings manufactured from wood. 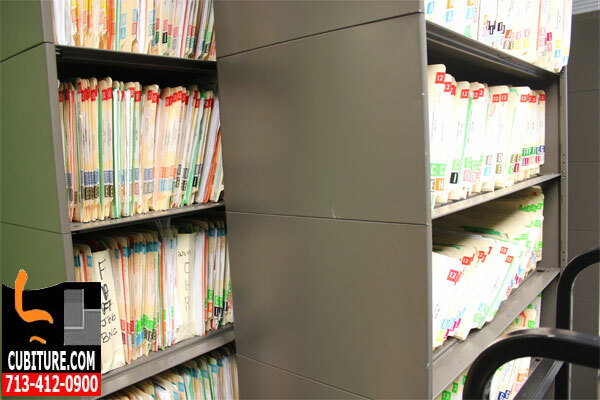 Not only does Cubiture accommodate organizational requirements with office furniture systems, we also accommodate human health and welfare. Human health plays a crucial role in workplace productivity. Studies have proven over and again that ergonomic seating and desking solutions that offer specific types of support to the human body have a measurable impact on improved productivity and employee morale. Utilizing adjustable height desks, and using seats with appropriate head and neck rest support, can also alleviate stress on the neck that often leads to chronic headaches. Some workstation options we design also feature desks that allow you to stand while you work (and sit when you want to) so you can experience a blend of comfort and exercise. This minimizes damage to the lower back that often results from concentrating the entire weight of the upper body on the base of the spine while seated. Like any investment, furnishing your office offers a tangible return proportional to the initial purchase. Your company will profit more when you decide in advance to invest in higher quality materials, adjustability, longer lifespan, comfort, and superior functionality. By minimizing workspace stress, clutter, and inefficient process flow, Cubiture office furniture systems integrate workspace design directly into organizational process flow. By supporting the functionality of the organization as well as the people who run the organization, we offer your organization the best possible returns on an investment that not only reflects your value, but ultimately magnifies your value. Call 713-412-0900 for a free office design layout. We may also be able to buy back some of your used furniture that you no longer need.